“What do you do when you fall down? You get up. And if you fall down again? You get up again.” I am Sandra Colis. When I was 9 years old, I had a fainting spell and awoke with a high fever. My condition was diagnosed as Tetraparesis and it left me paralized. I could only move my eyes and talk. I did not allow that challenge to dampen my spirits. I had a talent, I knew I could paint. I wanted to gift the world with that talent. And so, I learned to use my mouth to do the things people normally do with their hands. The pictures I paint are of my favorite subjects: scenery, animals, flowers, things that make me grateful to be alive. The beauty of the earth touches my very being and I am moved to express my gratitude for the gift of life. I cannot but help put on canvass the ethereal beauty I see in my soul. I cannot help but give voice to my talent through painting. You may say that life dealt me a raw hand – but I don’t agree. Without the experience of paralysis, I may not have been able to discover and develop my unique talent. I now paint with my mouth. Life for me is a gift. I have so much to give. Marilou Deniega “Malu” was born with mild cerebral palsy, which has kept her in a wheelchair with limited mobility of her hands. As a young girl, Malu would remain indoors while the other children went out to play. However, Malu stayed by her mother’s side and would watch her create designs for the baby dress manufacturer for which she worked. Her mother noticed Malu’s interest and would ask for suggestions in the designs which then sparked her own creativity in making paper dolls. 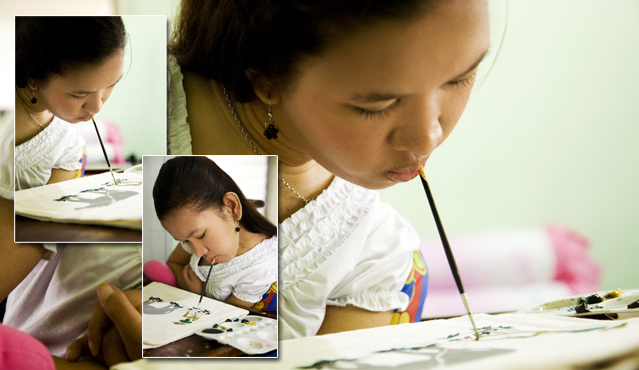 Upon seeing a finished product, Malu felt special and proud of her own artistic abilities. Malu realized her artistic talents when she won a competition in 1997. When her photo appeared alongside her winning piece she then believed her art was appreciated for art’s sake and not because she is a person with a disability. “I realized I am an artist,” Malu proudly explained. Malu took free painting lessons conducted at Tahanang Walang Hagdanan in Cainta under the auspices of Circle of Friends Foundation Inc., (COFFI). 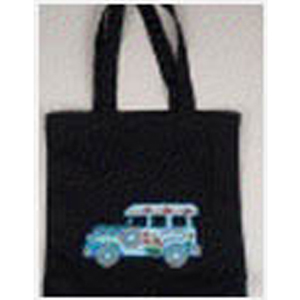 Malu’s jeepney designs on bags, aprons, and coin purses are her outlet for her original artistic talents. She continues to be inspired by her husband, fellow artist Alandino, and her son whose own creative expression is musical. For Romy Tarini, illustrating comics is his speciality and first love. He enjoys drawings which tell a story. 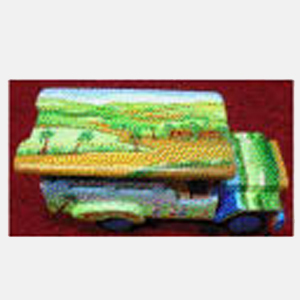 Romy has transferred that same love of story telling to painting scenes on jeepneys, each a picture of the Philippines. 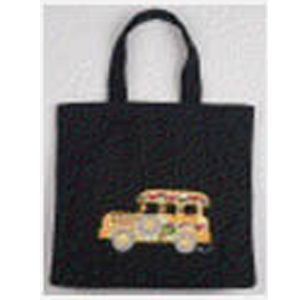 The endless possibilities and the infinite beauty of the Philippines offer opportunities for Romy to showcase his inspiration on the jeepney – the national Philippine symbol. Physically limited to a wheelchair since birth due to cerebral palsy, Romy is not confined in his creativity. His wife and young son inspire Romy to use his artistic talents to recognize the scenery around him. 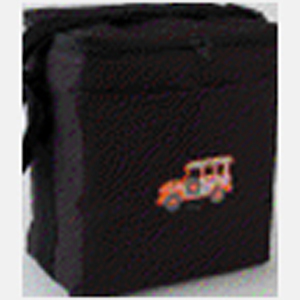 Often times, his young son, who has inherited his father’s creativity, makes requests for the jeepney collection. “My family inspires me to create, to paint,” Romy proudly explained. Marie feels that the consequences of polio do not in any way keep her from accomplishing on a par with anyone fully abled. She discovered her gift for the visual arts when her 6ht grade science teacher ask her to draw leaves on the chalkboard. In Marie’s worlds. “I’m very happy (while working on the huge canvas) “coz I can express my feelings through painting..
Fred was born in 1979 in Bacolod. At the age of 2 he got polio which affected his right leg. Consequently, Fred became aware at an early age that his disability would make an already difficult life more difficult. However, he doesn’t let this bring him down. You see, Fred is different. Besides being driven, he has an eye for appreciating and looking at things in an unconventional manner. In describing himself he says, “I’m a creative person: passionate and determined to create.” Fred pursued a degree in Advertising at La Consolacion College in Bacolod but was constrained to drop out due to financial problems. I drew while my playmates ran around in the fields. I drew late into the evening by candlelight. I drew during study time. I drew on every scrap of paper. I drew on rocks. I drew on walls. I drew on tabletops. I drew on the floor. Beautiful scenes filled my head. All I could think of was to capture these images on paper. It filled my soul to do so. It filled every part of me. When i got sick at 16 years old, they had to amputate my right leg due to a tumor. I was grief-stricken. It was like my whole reason for living had been taken from me. I was bitter, angry, feeling sorry for myself. But I remembered that I can look at life as a glass half empty. I can look at life as a glass half full. And that saved me. I picked up my brushes and painted my anger, my frustration, my sadness, my loneliness, my laughter, my joy, my courage, my stalwartness, my stubborn hope. I started with sketches, then paints, and today I have recreated and evolved as an artist. I do backdrops and graphic designs. Painting that once saved my life as a young boy now saves and serves my family. It continues to sustain me emotionally, spiritually, and mentally. It has awakened a deep hope that life is really as I make it. AND I WILL ENGAGE LIFE. I WILL LIVE OUT LOUD. I AM FRANCIS, AND I AM A PAINTER. MY WORK MAKES THIS WORLD WORTHWHILE. Juanito is married and has three children. After a bout with measles at 8 months of age, he lost the ability to move his legs. 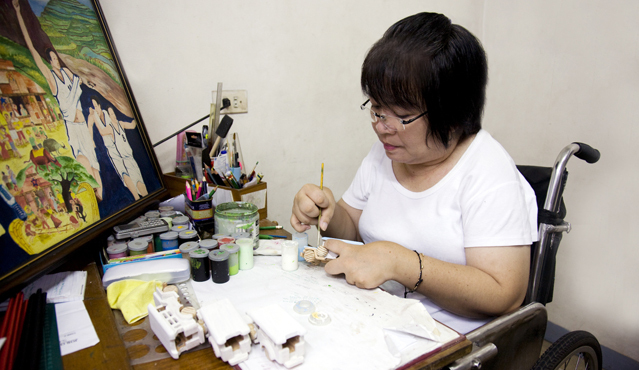 His talent for painting was confirmed for him when he won the Phizer Philippines painting contest. As he expresses himself through his art, he feels happy and satisfied. Elkie is married and has three children. During an excruciating battle with bone cancer in 1989, her right leg was amputated above the knee. By 1991, she was fitted for a prosthesis. Through she has been fond of drawing and coloring since grade school, it is only now that she has become aware of her talent. in Elkie’s own words, “Every color in her paintings has a meaning related to my life”. She is proud of her achievement – THE BIG CANVAS. 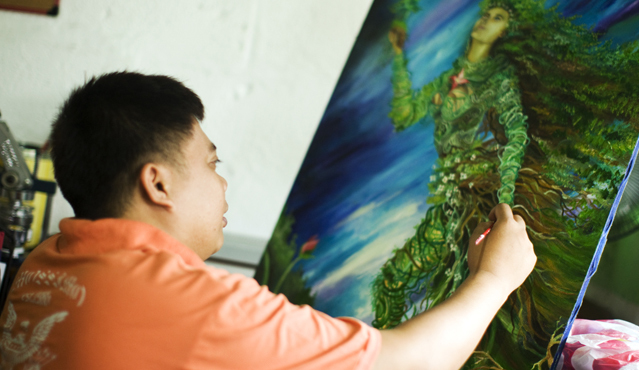 A teacher and an artist, Mastervic has been painting since he was a child. His inspiration comes from the desire to express what is in his mind. For Mastervic, painting is his form of communication. 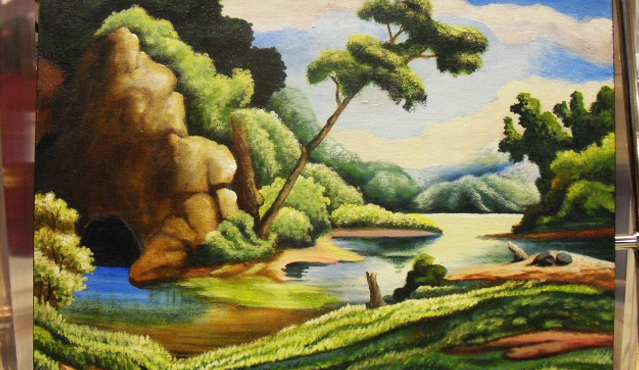 Landscapes are a favorite although he is not partial to any specific style as he likes to use various artistic techniques and mediums from charcoal and pastels to oils and water colors. He draws motivation from Cesar Legaspi, the award-winning Filipino painting artist. Born to a musician father and a teacher mother, Mastervic uses his painting talents and encourages other artists, both able bodied and PWD, as an instructor in COFFI art classes. He has worked within various artistic genres including the theatre and fine arts. Mastervic attended the Capiz Institute of Technology at UP Ilioilo and, at present, owns and manages an art gallery in Cainta.